Why Go to Online College? Online college is convenient, flexible, and accessible. These benefits are fairly well-known. But the continued surge in online college enrollment may be about a lot more than mere convenience. For some students, online college makes otherwise inaccessible degree programs available and affordable. For some students, online college may allow a level of engagement and personal attention that wouldn’t be possible in a large, traditional university. For others still, online college may be the only option, the clear pathway when all others are blocked. That’s how it was for Samantha Campbell. In 2014, disaster struck. Samantha became another casualty of America’s slow economic recovery. In the throes of budgetary crisis, Samantha’s company axed her positon. Suddenly out of work, the Jacksonville resident faced a tough choice. With two small children, childcare was beyond expensive, remembers Samantha. So when her husband suggested returning to school to broaden her career prospects, there were more than a few questions. Samantha wondered, How would I obtain my degree? What were my options? These questions grew only more complex when the Campbell’s learned that a third child was on the way. It was a blessing to be sure, but one with a huge and indefinite price tag. Her ambitions aside, the cost of childcare alone gave Samantha pause. How could she pursue an education while managing her two young children and a newborn? This, she remembers, seemed to be the most viable option for our family. This way, I could finish my degree and still be in a position to care for our children. I still found myself having to obtain childcare for some things [such as] final exams and special projects. But it still proved to be a tremendous savings for our family. Samantha enrolled at Florida State College at Jacksonville and began her journey toward a Bachelor’s Degree in Education. That was five years ago. With Spring Semester 2019 just getting underway, we got a chance to catch up with Samantha. With more than 100 credits under her belt, and a few more children under her roof, Samantha tells us that Online college has helped me tremendously. I have six children and childcare costs are astronomical. Since I take most of my classes online, I can avoid the cost associated with childcare and gas. I can still obtain my education and still be in a position to take care of my family responsibilities. With six children, those responsiblities are considerable, to say the least. For Samantha, online college has made possible what might have been unthinkable for working mothers just a generation ago; the hope of something greater. As Samantha tells us, You cannot downplay the value of an education. An education truly opens your eyes to the world around you. The value of an education is immeasurable. With my degree I will automatically qualify for a higher salary. But the value that has been added to my mind is the real treasure. Of course, everybody has different goals, different needs, and different educational objectives. Samantha’s experience is joined by countless other personal stories spotlighting the unexpected and inspiring ways that online education has created hope, opportunity, and achievement, particularly for those who might otherwise lack access to all three. These stories tell the personal side of a growth trend with far-reaching implications in the educational sector. It’s no secret that online college has grown in availability, credibility, and popularity over the last two decades. After all, it is spurred by a constantly evolving mode of technology. What you may not know, however, is that online college is significantly outperforming traditional college in enrollment growth. While year to year enrollment in traditional campus programs has been stagnant — even declining in some years — the number of students in at least one online course has steadily grown. According to the Education Department’s Integrated Postsecondary Education Data System, which provides the most up-to-date information on enrollments in online and distance education, the proportion of eligible students enrolled in at least one online course rose from 27.1 percent in 2014 to 30 percent in 2016. In online grad school, the jump was from 32.5 percent to 36.6 percent. So why is online college doing so well even as other sectors of higher education suffer the blowback of crushing student debt and skyrocketing tuition? Well, there isn’t one single answer. But thanks to you, our faithful readers, there may be a lot of different answers that all amount to one single fact: Online college makes a whole lot of sense to a whole lot of students. The reasons to choose online college are pretty extensive but we wanted to get a stronger sense of just exactly how you — real, actual online college students and online graduate students — feel. So thanks to the nearly 1000 of you who responded to our TheBestSchools.org online scholarship contest, we’ve honed in on some of the very best reasons for choosing an online school. If you’re already kind of convinced, feel free to jump right to this year’s brand-spanking new ranking of The Best Online Colleges. Otherwise, prepare to be convinced by a big panel of your peers. Among the top reasons cited in your testimonies were the familiar refrains of convenience, flexibility, and accessibility. Your testimonies suggest that online classes and online degree programs create new opportunities for people who can’t otherwise attend traditional colleges. This may be for reasons of mobility, geography, scheduling, health factors, and other personal responsibilities. Respondents also pointed out that online college can be more affordable because it provides a degree path that doesn’t include costs like room & board, meal plan, or campus fees — to say nothing of gas, tolls, and parking tickets. And like Samantha Campbell, a number of respondents pointed out that online college was really the only way to pursue an education that was compatible with the practical and financial demands of family. If affordability is your top concern, we’d advise starting with The Affordable Colleges Source. Accessibility is one of the strongest arguments in favor of online education. For so many students, it’s not enough to suggest that online college courses are a good option. It’s more accurate to say that they are the only option. For instance, Jazlyne, working toward her Master’s in Education at Boston University says I chose to pursue an online degree program in order to attend the best school for my program while living out of state. I am married with a toddler son, so it is very important for me to have flexibility in my educational program, while continuing to work. None of this would be possible with a traditional degree program. For others, this access is a practical way to overcome challenging medical factors, disabilities, or other health-related issues. Serenity, working toward her BS in Applied Psychology at Walden University, says that online school allows me to create a flexible schedule, that works around my medication requirement and resting schedule. For Serenity, this also means physical access to educational resources in spite of her medical challenges. She notes that online education has allowed her to access greater amounts of research information via online search, joining online student study groups and communicating with other psychology students who will become future colleagues. This accessibility also points to a surprising finding, one that popped up time and again in your testimonies. Many online students highlighted their heightened access to professors. Lukasz, a Doctor of Engineering candidate at George Washington University, confirms as much, noting that The best thing I have experienced so far taking classes online is being able to go to class on my computer and easily access to all needed materials quickly. This helps to communicate quickly with professors and collaborate faster with a record to look back on. Or visit our Disability Guides to check out a ton of other valuable resources for students with disabilities as well as family members, educators, and advocates. Flexibility was another major recurrent theme. Online students prize the inherent flexibility of this format, and most say that it’s an absolute necessity for their respective educational needs. For instance, Melissa, a Master in Health Administration student from St. Joseph’s University says I am currently working full time. An online degree program gives me the flexibility I need to obtain a master’s degree while still being employed. Like Melissa, Whitney chose to pursue her Master of Science in Nursing online at Grand Canyon University so I would be able to continue to work full time while going to school. For more tips on advancing a career or simply balancing your current job responsibilities with a great online education, pay a visit to our resident Career Counselor. For many student, access and flexibility dovetailed with the sheer fact that online college defies the laws of time and space. Well, maybe that’s an exaggeration. The basic rules of physics still apply. But geography is no longer a factor. Melissa from St. Joe’s noted that, in addition to being compatible with her work schedule, online education allows me to take my classes from anywhere. I have a very long commute and the school that I am attending is even further… the online program allowed me the opportunity to still get the degree from my university of choice without an even heftier commute. This is an especially important factor for students living in remote rural regions, or in parts of their state that may otherwise have limited access to higher education opportunity. For instance, Cornelia, a Master of Science in Nursing student from Northern Kentucky University says I am a non-traditional student with a job and family. We live on a farm and relocation is not an option. If not for online programs I would not be able to go to college. Obtaining my degree online allows me to continue to work while I study. This not only saves a lot of time but also helps with the expense. While flexibility and access are oft-noted benefits, many of you cited a far less-expected benefit. In the early days of online education, critics worried that this new medium would result in an isolated educational experience, one absent the dynamic human engagement that happens in a physical classroom. Not so, say some of our respondents. Elise, for instance, a Master’s in TESOL student from Regent University, said that For me the best part of going to graduate school online is that it makes me have to become more organized and dedicated to improving all areas of my life in order to finish. The students at Regent University receive support from each other and the professors along with the academic advising staff. It is easy to believe that they want you to succeed. For Elise, this support was particularly meaningful as she worked to overcome a number of external challenges in her life. She noted that online college made it possible to attend school even though I do not have a permanent place to live as of yet. I have been staying with family and friends since October. I have since won my disability case and hope to have my own place soon. I would not have been able to do this if I went to school on campus. Overall it has been a catalyst to change my life for the better and to do it. For Joshua, the personal engagement was one of the great and unforeseen benefits of online grad school. A Master’s of Business student at the University of Louisiana at Lafayette, Joshua says that One of my worries of fully online classes was wondering about the lack of networking with other classmates that would have been available with a traditional program. However, I have already managed to become close with a couple of other classmates and the beauty of it is that we don’t live anywhere close to one another. Do Any Online Colleges Offer Free Laptops? Adult learners are among the fastest growing populations in online college. Adult learners are sometimes referred to as non-traditional learners. However, adults returning to school, working professionals seeking new credentials, and students with children are all becoming more commonplace in colleges and universities. Perhaps non-traditional is not such an accurate terminology. Indeed, many of you have told us that you don’t necessarily fit the mold of a fresh-out-of-high-school freshman, and that this is one of the reasons online college makes sense for you. For instance, Lauren from Columbia State Community College, an Associate in Business candidate, says I currently work 40 hours a week in an office setting and will continue to do so throughout my studies. Taking online courses allows me the freedom to work and study on my terms especially as someone going to college for the first time at the age of 33. For Samuel, who is studying for a Bachelor’s degree in Business Management at Brigham Young University while simultaneously managing the very adult respsoniblites of job and family, online college was the only thing that made sense. He notes that My online college has been accommodating me to still work and provide for my family. First, I have flexible time in the evening to do my course after work. Second, they provide specific schedule and syllabus on when to submit assignment, quiz, discussions, and homework. It helped me to stay in line with my courses and while working full time to provide for my family. Why Are Non-traditional Students So Much Happier in College? So why go to online college? Well, if your testimonies are any indication, there are a lot of overlapping reasons. While everybody has their own reasons, most of your stories share a combination of circumstance, ambition, and opportunity. Certainly, this was true of Samantha when she first made the leap into her online education back in 2014. Now, with the finish line on the close horizon, Samantha’s life has truly changed for the better. She tells us that I have three classes left and I will graduate with my BS Degree in Education. I am ecstatic. It feels amazing! I am almost there. I am also doing it with honors. Five years ago, Samantha’s family faced a crisis. Online education allowed the Campbell’s not just to overcome their crisis, but to build a better future. Today, she aspires to help others do the same. Samantha will use her degree to begin a new career in education. Speaking from personal experience, she explained An education is a truly valuable commodity indeed. I want to help others reach success by becoming an educator. Remember, she advises, to have fun and enjoy the journey. You are doing something that will benefit your entire family… Be grateful and be thankful you are in a position to obtain an education. When you can, visit the campus and take part in festivities. Sometimes, you can feel disconnected since you are an online student. Be proud of your alma mater… Attend events at the school whenever you can. Even though you take your classes online, you are still a part of the school. More important than anything is to feel proud and celebrate your accomplishments. With only three classes to go, Samantha has a lot to celebrate. 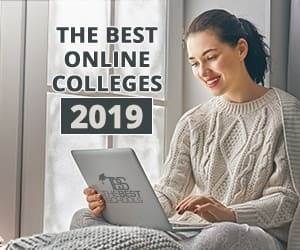 If you are considering an online education but you aren’t sure where to start, begin your own path to success with a look at this year’s Best Online Colleges.